This salad is super simple but oh so good. 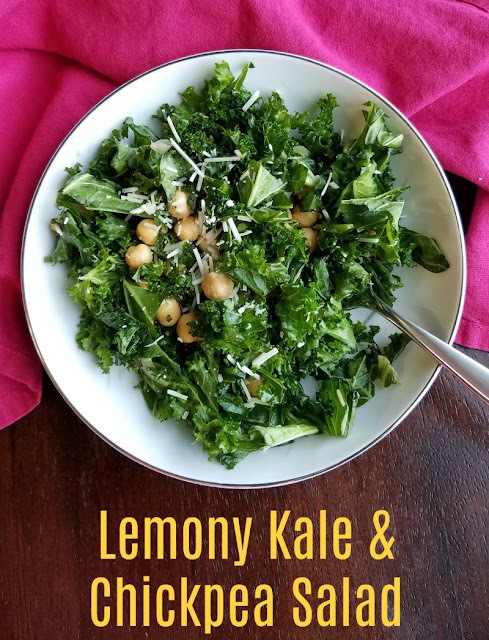 Kale and chickpeas are married with a bright lemon dressing for a flavorful and nutritious salad. This simple salad is packed full of nutrition. With a simple lemon and olive oil dressing, it is a perfect summer side. Unlike most salads, it is actually better if it has a while to sit in the dressing making it a perfect make ahead for entertaining as well. All you have to do at meal time is toss and serve! We finally did it! After years of talking about joining the local CSA, we finally just did it. We were hesitant because there are always points in the summer when it's hard to keep up with our own garden. After much hemming and hawing we decided it would be a great way to force variety into our vegetable routine. Plus it speaks to our shop local when we can desires. It doesn't get much more local than the farm we drive by regularly. For those of you unfamiliar with CSAs, it stands for Community Supported Agriculture. Basically we paid a fee to join before spring, giving the farmers the capital to buy seeds amd supplies. Then we get weekly boxes of produce filled with a variety if whatever is in season. We are really looking forward to seeing what all we get over the course of the next 17 weeks. We decided to purchase a half share because we do have our own garden that usually is pretty plentiful, but our first box was still brimming with goodies. Hopefully this will translate into a lot more seasonal produce heavy recipes here as well. If you are used to coming to my corner of the internet for cakes and frosting, don't panic! I am sure there will still be plenty of that as well. I mean, I am still me after all! Of course this time of year it was heavy on greens including a generous bunch of curly kale. Usually I cook kale in things like soup, on zuppa inspired pizza, even in quiche or baked into chips. However as hot as it's been and as busy as we've been with my brother's wedding and sister's graduation I thought a kale salad would be a nice change. Normally the kale salads I've had use a sweet dressing and dried fruit to balance out the kale. I wanted to try something different this time though. We were planning to grill up some lemon and yogurt marinated chicken, so this simple salad dressed with lemon and olive oil called to me. While kale has a reputation for being a bit tough and slightly bitter, you can easily combat that with a little planning. First, be sure to remove the ribs. Then go ahead and run your knife through it to chop it relatively finely. While this is discouraged with more delicate greens, it is encouraged with kale! Also, go ahead and dress the salad a few hours ahead in you can. 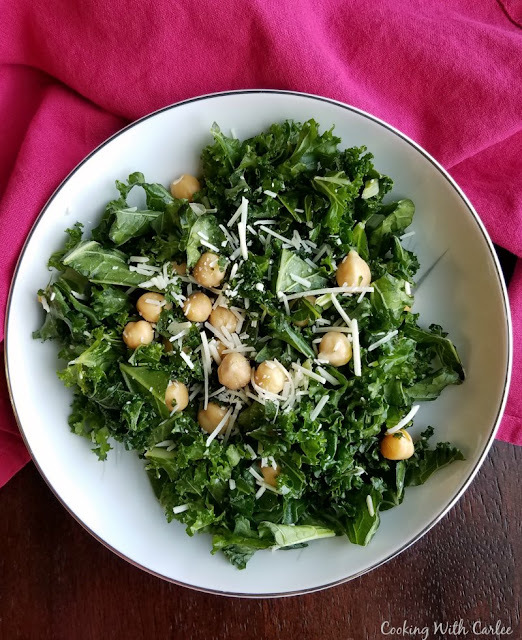 The prolonged exposure to the lemon juice, oil and salt help make for a milder texture and flavor in the kale and you don't have to worry about soggy salad. I encourage you to try this bright and fresh salad with your next bunch of kale as well. Meanwhile in case we get more kale next week, what are your favorite summer kale recipes? 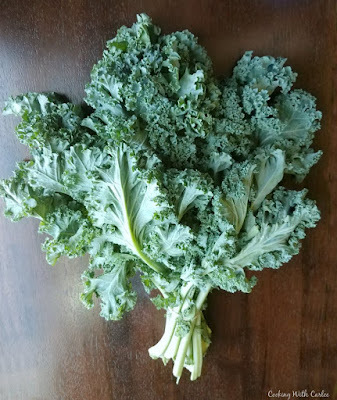 Remove leafy green parts of kale from the stems. Discard stems and chop leafy part relatively finely. 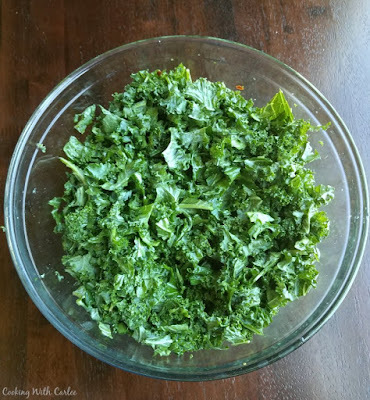 Place chopped kale in a big bowl and drizzle in lemon juice and olive oil. Season with garlic powder, salt, pepper and red pepper flakes. Vigorously toss to coat kale in dressing. I like using my hands for this to make sure it is really coated. Drain chickpeas and toss with greens. Cover and refrigerate for a few hours before serving in possible. Sprinkle with grated Parmesan and toss before serving. Leftovers hold up well for a couple of days covered in the refrigerator. YUM! I feel healthier just looking at this great salad!! Have a wonderful Wednesday! Ha! It is healthy and delicious, the perfect combo! Hi Carlee, the other day I put a kilo of chickpeas in the slow cooker to cook and freeze for salads. I over cooked them and we now have enough hummous to last a lifetime (luckily it freezes well too). We don't get kale here, but this is a salad I would try with spinach. Lemon juice, garlic and olive oil are what are summer meals seem to be of!... The CSA sounds like a win-win situation, everyone's a winner. Ha! That happens and eat least hummous is delicious too! It would be great with any greens, you just wouldn't want to dress it so far in advance with more delicate greens. Carlee, this sounds wonderful! A great way to get some chickpeas into Mr Delightful who thinks he doesn't like them! Pinning this for later. My kale is starting up well in the garden, and I just love chickpeas! You are going to love this then! Your salad recipes are seriously making me drool this week! I've always wanted to try a CSA but struggled with that for the same reasons as you! With both of our work schedules so crazy this year, we did cut the garden in half, and I figured that would be incentive to get to more farmers markets. I never even thought about a CSA being the answer But, this salad sounds great! I have tried kale several different ways, and while I don't hate it, I just can't "love" it yet. I will add this recipe to the summer list! We are enjoying the CSA so far. It has been fun trying new produce and having an excuse to try things in new ways! We will love your salad Carlee, it looks delicious! Hope you are having a great week and thanks so much for sharing your awesome post with us at Full Plate Thursday! I hope you do, Miz Helen! Congratulations on joining the CSA. It is always nice to be a part of something that is local and I have found that even though I may have the same thing in my garden, sometimes it is fun to get something from someone elses garden. This salad looks delicious. I don't know what it is about chickpeas but I have always loved them. My mother loved them and maybe that is where I grew to love them. Anyway, the salad looks wonderful. I hope that you enjoy your CSA produce all summer long! I've been eating more and more kale and loving it. Chickpeas are my favorite thing to add to a salad too. This looks SO fresh and delicious! Thank you for sharing it at Whimsical Wednesdays Link Party! It is so simple, but so good! Thank you! I need to share this recipe with my brother - his garden is overflowing with kale. I've been eating lots of chickpeas lately, but have yet to try kale. This looks like the perfect way to do it! Thanks for the inspiration for joining a CSA. I've seen it mentioned in blogs, but your description has inspired me to look into it. Great salad too. Love the make ahead idea. 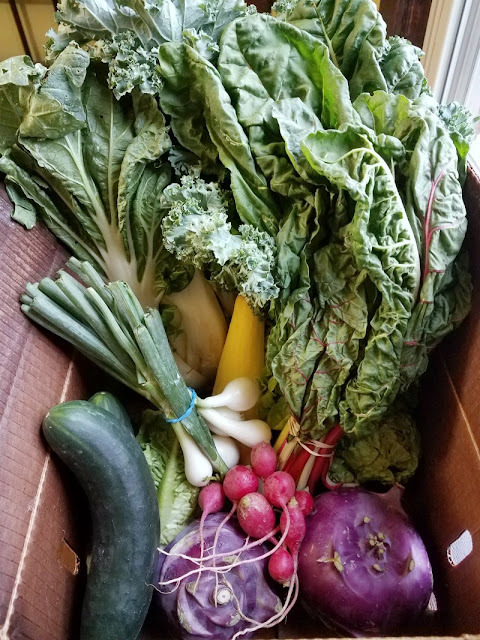 We have had a vegetable box delivered for years and it has helped me be better about trying things I might not otherwise. This sounds tasty with the lemon dressing. I am in a CSA too, I love all of the fresh veggies. The only difference is that I can pick out my veggies. And this salad sounds delicious!